Samantha struggles to follow her own advice when writing a column for the school newspaper reveals a hidden desire. Samantha loves being a star reporter for the school newspaper, and she especially loves it when she’s teamed up with her crush, Michael Lawrence. So she’s especially upset when Mr. Trigg doesn’t pair them together—will Michael forget all about her if they don’t work together? And to make matters worse, Sam’s best friend likes a boy whom Sam can’t stand. How do your tell your best friend you think she has terrible taste? To keep her mind off of her own problems, Sam concentrates on writing her Dear Know-It-All advice column. 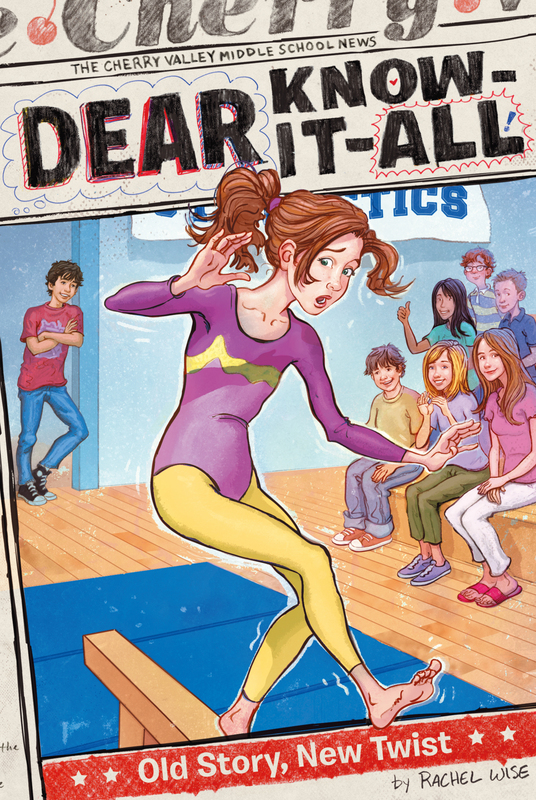 While encouraging a letter writer who’s too shy to try out for the gymnastics team, Sam realizes that she’d secretly like to try out for the team herself. Sam advises the hopeful girl to “Go for it! Don’t be afraid! Reach for the stars!” But can Sam take her own advice? JOURNALIST CAN’T KEEP QUIET, TROUBLE ENSUES! When I am the editor in chief of the Cherry Valley Voice next year, I will let people pick their own article topics. I will not assign them whatever boring story I want, just because I can. The headline of my first issue will say, Martone Frees Writers from Shackles, Staff Rejoices! In case you can’t tell, I am a little annoyed right now at the editor in chief of our school paper. I don’t like the article that she and our faculty advisor, Mr. Trigg, have assigned to me for the next issue. And I really don’t like the fact that they have separated me from my unofficial writing partner and crush of my life, Michael Lawrence. I have known Michael Lawrence forever, but I only started loving him last year, and we only began working together this year. He is by far the best-looking boy in the school, and I say this not as an opinion, but as a fact. Lots of other girls think it too, and I can cite my sources, like the good reporter that I am. But I won’t, because if there’s one thing I don’t like to think about, it’s other girls and Michael. My best friend (also forever) is Hailey Jones, and she says Michael likes me back. She also has concrete facts and evidence that point to this, but most days I find it a little hard to believe, since nothing has ever come of his so-called liking me. For instance, Michael insists on calling me “Pasty,” a nickname he made up in kindergarten when I tasted the paste in art class. (I was five, I thought it was frosting, blah, blah, blah.) But Hailey says that Michael calling me nicknames means he likes me. She also points out that he has baked his famous cinnamon buns just for me on more than one occasion. I argue that it could be coincidence, or they might have been leftovers, but she is firm on this point. Anyway, all I know is that if there are this many (and more) reasons why Michael Lawrence supposedly likes me, then why doesn’t he ask me out or something? We get along pretty well, and he likes to tease me (Hailey says this is a good sign too), and we certainly work well together. Or we used to, anyway. Who knows if we will ever work together again? Here’s what happened: At our bi-weekly editorial meeting yesterday after school, where we get together to go over the previous Friday’s issue and make plans for the next one, Michael pitched an article about the school district’s investments. I perked up, waiting to see if Mr. Trigg (faculty advisor) and Susannah Johnson (editor in chief) would like it enough to assign it to us, since by now it’s basically an unwritten rule that Michael and I write together. Well, they liked it all right, but out of nowhere, Susannah suggested that Michael write it with Austin Carey because his dad works in finance, and Mr. Trigg thought that was a “smashing idea!” (He’s British and he always says things like that.) Well, I can tell you one thing I wanted to smash after that meeting, and it wasn’t an idea. Michael was excited that they liked his idea, and then Austin came over and high-fived him and they began brainstorming right away, so I don’t even think he was sad we wouldn’t be working together. And if that’s the case, how can he possibly like me? Humph. He didn’t even say good-bye to me when I left the room. Well, Michael can just see if Austin Carey saves him a seat when he’s late for events, or if Austin Carey takes great notes in interviews to back up Michael’s supposed steel-trap memory, or if Austin Carey comes up with amazing headlines. Well, that was how I felt all last night. Just plain mad. Now I’m also disappointed, hurt, frustrated, and sad, and I’m sure more feelings are on the way. Oh, I’m also scared. That’s actually the main one. I’m scared that if Michael and I aren’t paired together on a story, then we won’t see each other at all. Because when we are working together, we usually have lunch together, then we sometimes meet to go over stuff, then we e-mail back and forth. And now, without a reason or excuse to be in contact, I’m not sure he’ll ever speak to me again! After all, without a story to work on, I can’t exactly ask him to have lunch with me, can I? I might as well put a headline on the front page of the paper that says Martone Loses Her Mind, Openly Declares Love to Crush. Anyway, I will be very busy, so it’s not like I’ll have time to hang around and pine over my lost love. Susannah gave me a boring assignment for the next issue, and that is part of what makes Michael’s assignment so annoying to me. I know on the one hand that I should be glad to have an easy gig this issue, because many of the articles I’ve worked on lately have taken up a lot of my time. This one won’t. But the thing is, my recent assignments have been interesting. This one just isn’t. Here’s what I have to do: interview a bunch of eighth graders who are graduating this year and ask them what their happiest memories of Cherry Valley Middle School are, whether they have any regrets, and what advice they would give to other students in the sixth and seventh grades. Fascinating, right? A regular snoozefest if you ask me. I don’t mean to be a bad sport, but come on. This is sixth-grader work, not ace-reporter-probably-next-year’s-editor-in-chief-unless-Michael Lawrence-gets-it work. It will take me all of a day. I can probably take a nap at my desk while some boring eighth grader drones on and on at the other end of the phone, and I’ll still catch the gist of it. The only hard part is going to be making the article seem interesting. Meanwhile, I do have quite a lot of mail coming in to my secret, private mailbox. As the Cherry Valley Voice’s Dear Know-It-All columnist, I give advice to students who submit letters or e-mails. And it’s all anonymous—nobody, and I mean nobody other than Mr. Trigg—knows I’m Dear Know-It-All. Not even Hailey. When Mr. Trigg called me at home at the beginning of the school year, I thought he was firing me from the paper. But it turned out he wanted me to write the advice column. This actually is a top assignment, and for the person who writes it, it usually means you’re at least on track to be editor in chief the following year. If you don’t make a mess of things, that is. Well, I’ve been in a few sticky situations so far this year, but I haven’t made a total mess of anything yet. One thing is for sure: The volume of letters I get has been increasing. And that’s a good thing, because it gives me more options to choose from when I pick what I’ll answer each week. Many of the questions are pretty dumb, like “How do I pass math?” (Um, study?) But some are juicy and a few are even really sad. Sometimes I need Mr. Trigg’s help in dealing with some of the situations, and he’s been really great so far. I do like him a lot, even if he has separated me from my crush like a wicked king in a fairy tale. After morning classes today, I stormed off to the cafeteria to find Hailey so I could rant and rave. Luckily, I spotted her right away, on the food line, looking for me. I got a tray and skipped the line in favor of the special table where they offer an organic option every day. Today it was lentil soup with a whole-grain roll. Pretty tasty, and only a dollar! I looked around for a place to sit, and as I glanced around the room, I spied Michael Lawrence and Austin Carey sitting at a table in the corner, chatting away. My blood began to boil all over again. That should be me sitting there with Michael, not Austin! Michael is my writing partner, not his! I realized I was staring, and I quickly looked away, pretending I hadn’t seen them. I hoped Michael hadn’t noticed me looking. I knew one thing, though: I was not going to act like I cared that we had been separated. After all, hadn’t Michael had a chance to say, I’m sorry, but as much as I’d like to work with Austin, I’d love to work with Sam again? “Ready, Sammy?” said Hailey, suddenly at my side. Her tray was loaded down with her usual odd food choices—rice with butter, chocolate pudding, chocolate milk, and saltines. “Just as long as we’re sitting far away from Michael,” I grumbled. “Yeah, sure.” Hailey laughed, thinking I couldn’t be serious. Usually, I want to be as close to Michael Lawrence as possible. Then she looked at me and saw I wasn’t joking. “Whoa, what’s up?” she asked. In silence we walked to a table at the opposite side of the cafeteria from Michael. We wedged ourselves at the very end of the table, leaving a gap between us and a group of eighth graders sitting at the other end. As soon as we were seated, I began venting, filling Hailey in on the whole annoying story. “That is a bummer,” she agreed when I’d finished. “How? It’s nothing but the end, as far as I can see,” I said miserably. “Well, it’s not like I have all that much else going on. I mean, besides my article and—” I gulped. I’d almost said, Dear Know-It-All. “And what?” asked Hailey suspiciously. “And . . . ” Mentally, I skimmed the calendar of upcoming school events that we’d reviewed for coverage in our staff meeting. “And gymnastics team tryouts!” I blurted. Uh-oh. I regretted it as soon as I’d said it. Journalist Can’t Keep Quiet, Trouble Ensues! Let me just say right now, as an aside, that Hailey is a superjock and I am a super-not. She is cocaptain of the girls’ varsity soccer team, even though she’s only in seventh grade, and she plays all year round (something called Futsal in the winter). She has two older brothers, and all they do in her family is play sports outdoors and then go home and play sports indoors on the Xbox and Wii. She is always trying to get me to try out for the soccer team, but as I point out, I would not make her team, so what would be the point? Anything with footwork is my main problem. I am a klutz who trips over everything (Michael even changed my nickname from “Pasty” to “Trippy” a while back after a couple of particularly clumsy days). But I do have a little secret, and Hailey knows it: I am really good on the uneven parallel bars. I know, right? Go figure. It’s such a random skill, and certainly not that useful. Kind of like a party trick. Most people have no idea I can do it. Sometimes even I forget, but then we have the gymnastics unit for the trimester and I ace the bars, people are wowed for a few days, and then everyone forgets again. Actually, I guess it’s not totally random because my perfect older sister, Allie, was the star of the Cherry Valley Middle School gymnastics team a few years back. In fact, each time the gymnastics coaches hear my name, their faces light up, hoping I’m made of the same star material as my sister. But then I try a floor routine or the balance beam (both of which require, um, walking), and I trip and mess up and generally make a fool out of myself, and everyone realizes again that I’m not Allie. The truth is, I have always harbored a secret desire to try out, and Hailey is aware of this. But now I wish I hadn’t opened my mouth because I know she will go on another crusade to get me to try out, just like she did last year. Now, there is nothing more boring to me than hearing about practicing for sports. It’s like hearing people talk about their dreams from the night before. Yawn! I knew Hailey was only being a good friend, but my attention started to wander. And it wandered right over to Michael Lawrence, who caught my eye and then had the nerve to smile and wave at me! Why did I have to look at him in the first place! “Ugh!” I said out loud, interrupting Hailey’s monologue. “So wave back, you idiot!” said Hailey. Visions of Hailey grabbing my hand and conducting a false wave made me shudder. I figured I’d better do it myself. I looked at Michael again and tried to catch his eye. When he glanced my way, I did a quick nerdy wave, and I think he saw me but I wasn’t sure. Anyway, that was good enough. “Satisfied?” I said to Hailey. I felt deflated. I knew she was right. Why did I always make such a mess out of everything? Hailey turned and looked over her shoulder at Michael’s table.